You never know when a natural disaster will strike. It occurred to me today, as I make phone calls to family and friends, outside of my particular area, to be sure my the people that I have asked, are still ok with me bringing my pig to their house, should I need to, that not everyone is prepared for an emergency. Do you have plans in place for your pig if you should need to be evacuated for any reason? Do you have enough supplies on hand in case you can't leave your house? What about access to water should your water become contaminated? These are things you need to be prepared for because they can happen. With natural disasters occurring all over the world, and taking us by surprise, it is ALWAYS a good idea to be prepared ahead of time. Have back up plans for back up plans. Keep a mobile first aid kit available that is separate from your possibly larger first aid kit at home. This kit should have emergency type supplies that you may need if you have to leave home with an injured animal. You need to be sure the kit contains supplies for burns, fractures and wounds, at the very least, since these are the most common injuries during natural disasters. Click here to see a great first aid page with separate pages for many common ailments and solutions to help you work though an emergency with your pig. Feel free to print off anything from the website for your personal use. Keep a book with this information in it for your pig should you need information in a hurry, especially if your internet access is limited or not available. If it's the only thing you do to prepare for an evacuation, you need to be sure you have a pig friendly place you can go should you need to leave your home on a temporary basis and a way to transport your pig(s) to safety. Keep in mind, despite articles circulating on social media, hotels/motels, etc are NOT mandated to accept your animals during an emergency. You’ve probably seen some posts on Facebook claiming that the Pet Evacuation and Transportation Standards Acts requires hotels to accept evacuees’ pets. Sadly, this is inaccurate. Click here to read more about that and to see the actual laws with regards to pets. You should have your pigs medical information handy, vets number, emergency vets number and a number to a vet that sees pigs wherever you are going. If your pig takes medications on a regular basis, you should also have at least a weeks supply of meds (often checked and rotated for meds that aren't expired) and also a food supply. Having these basic things already taken care of or planned out will save your nerves in the chaos of an unexpected evacuation. Instead of assuming the worst in people, let's assume a pig was NOT agreeable as many wouldn't be and the decision to leave ones pig behind was made with a heavy heart. We are all outraged. BUT, when I really think about it, MY pig would be a struggle. MY pig would NOT be agreeable and I would have an extremely difficult time in getting her IN my truck. As it stands, it takes about 3-4 people to get her in the truck. What if I only had 4 minutes to get this done while also in panic mode and trying to think of other life saving items I need to grab. This is a tough spot to be in and I cannot imagine having to make that kind of decision. Use other people's tragedy to build a better tomorrow. Ramp train your pig. Make sure the items you would need to load your pig are easily accessible. Do practice runs with your pig to desensitize your pig to getting in and out of the car/truck/SUV. Help to educate others by formulating your own emergency plan. How would you react if flood waters suddenly came to your back door? What would you do in the event of a tornado? What about fire? If your home was suddenly engulfed in flames, how would you get your pig out? Now imagine losing everything you have and reading how disgusted people are with you for leaving your pig behind. That is probably the worst part of it-dealing with the aftermath when you have had to make the hardest decisions of your life. Delegate responsibilities to each family member so you can cut the time it takes to get all your animals together and loaded. Practice emergency drills with your family and see how long it takes you to get your animals to safety. Know where you can go, do you have family that you can stay with or a shelter that allows pigs? Keep an emergency supply kit accessible. Keep names and numbers of vets and other important information in an area you can easily get to. Crate train your pig, ramp train and harness train your pig. BE PREPARED because you never really know when you will need to be. It's always better to be overly prepared rather than not ready at all. Learn from others mistakes and try not to judge their actions. Until you have been in a life threatening crisis, you have no idea how you would react. And until you have met their pig and witnessed their interaction and relationship (because let's face it, some pigs have better relationships than others with their human family), don't judge. Know all the facts before you do. I have joined in and expressed my outrage and disappointment in people when reading about these tragedies in past situations. But, as I said earlier, when I really think about it, I realize I was not truly prepared for an emergency either and that is definitely something I worked on and perfected over the last couple of years. My pig hates the ramp, she hates the stairs I bought for her, but she doesn't mind a crate. 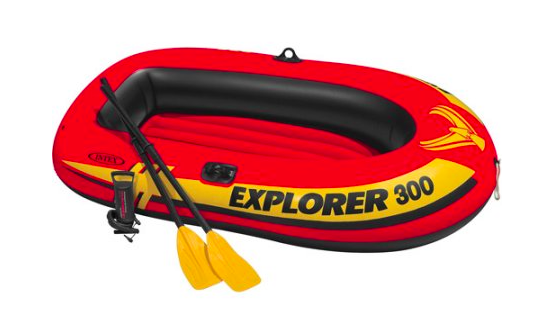 BUT, Who knows if she would actually get in it when her sense of impending disaster kicked in? Nonetheless, I know this has put it in a new perspective for me and has prompted me to get the training done. I don't ever want to be forced to make a tough decision like that, but if I am, I, at the very least, want to know I did everything I could to prepare myself for disaster if it should ever find its' way to my home in order to give my pig a fighting chance at survival. If there is a disaster headed your way and you're given amble time to make arrangements for inclement conditions, take advantage of that and don't wait until the last minute. ​Hurricanes, for example, are typically forecasted in advance. It may not be 7 days of warnings, but you will likely know within a couple to several days that a hurricane is headed in your direction. Find out if there are pet shelters being set up for the areas that will be affected and ask what types of pets they will allow. Prepare as much as possible beforehand. Hurricane Harvey in Texas 09/2017 taught us several lessons. 1st, the pig community rocks. They will come together and help each other as much as possible and that is great. 2nd, wildlife is affected by rising flood waters forcing feral pigs out of hiding and into neighborhoods. That though never really crossed my mind, but they are seeking shelter and somewhere safe as well. Places you wouldn't ordinarily see a feral pig is all of a sudden overrun with them. Hurricane Harvey proved that. These feral pigs had nowhere to go and then the ferals and domesticated pigs left behind were trapped, in homes, on roofs. Very very sad situation. Please get a plan together and routinely run through it to be sure everyone know what they should be doing, including your pig. This pig was later rescued, but placed on dry land and left to fend for him/herself. I believe the majority of us are grateful that the rescuers saved him, period. He definitely looks like someones pet pig. Hoping and praying he is reunited with his family whether that be human or other pigs. Devastation in that area of Texas, pigs aren't the only wildlife affected. Alligators/Crocodiles are also a threat in that area. Again, all things that need to be considered when there are impending storms. Keeping your pets safe during a storm? Make sure pets have some kind of up-to-date identification. 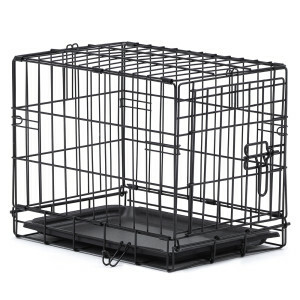 Be sure to write your pet’s name, your name and contact information on your pet’s carrier/crate. Consider microchipping your pet as a more permanent form of identification, this is especially important for pigs since collars aren't something we recommend for pigs. Harnesses can hold a tag with the critical information though. Always bring pets indoors at the first sign or warning of a storm or disaster or ensure their outside structure is safe from debris and or flooding waters. Secure any loose branches or limbs so they don't fall during a major storm onto your pigs outside enclosure. Pets can become disoriented and wander away from home during a crisis, so keep an eye on your pigs to be sure they don't wander off. Fencing may become compromised, so please be sure your pig stays secure in your yard if this is a possibility. Remember, while broken fencing can let your pig roam free, it also opens the possibility of an animal getting into YOUR yard. Please try and secure any loose or broken fencing for a storm where wind gusts are expected. Keep a pet emergency supply kit, including the following: three-or-more-day supply of food and drinking water; bowls for food and water; current photos and physical description of your pets, including details on markings; medications, vaccination records (especially rabies records) and first aid pet supplies; comfort items such as a toy and blanket; small garbage bags; your pigs bed; rooting box of some kind to entertain them. Keep a list of pet friendly places, including phone numbers, with your disaster supplies in case you need to evacuate. Many hotels, motels, campsites and other facilities around the country now allow pets. Check out AAA or petswelcome.com to find a list of those in your area. Hotels and motels may are not required to waive “no pet” restrictions in an emergency. Friends and family members living outside the area may be able to provide shelter, too. Pet owners should be aware that many emergency shelters do not accept pets – check with your local emergency management office to determine if a pet-friendly emergency shelter will be set up in your location. This will be even more difficult with a pet pig, so keep that in mind if you're in an area where shelters are utilized often and know which ones will welcome you and your pig. Try to make arrangements BEFORE you have an emergency. If you plan to stay during a major storm, dedicate one room to pets and supplies, if you can. Stock up so you're not left trying to scrape up things you need at the last minute. Know that during major storms, stores may be closed for up to a week afterwards. Some areas have blackouts and unless you have generator support, this also means no heat in the winter and no air conditioner in the summer. Why is this important? If you have a pig in your home that is stressed out, unable to go outside, these are prime conditions for your pig to get overheated, especially in the summer. Keep a battery operated fan in your emergency supply kit to help keep your pig cool during hot stressful situations. If a disaster strikes and you're not at home, make sure a trusted neighbor or friend has a key and your pigs schedule is posted somewhere they can easily access. (feeding/medications/water, etc) Keeping a written version of daily care on your fridge would be ideal so someone could walk in and step right in your shoes to care for your pig, if you're unable to. If you have a storm shelter that you can evacuate in to, do trial runs and desensitize your pig to the shelter. Make it a pleasant place so your pig will be agreeable to go in there should it be needed. For more tips on preparedness plans that include your pets, visit ready.gov or Humane Society Tips. Hurricanes aren't the only threat, some have tornados, mud and landslides, flooding, tsuami, wild fires, earthquakes and other natural disasters that are sometimes sudden and not something you have any time to prepare for. So prepare now. Find a friend or family member that will allow your pig to stay there should it come to your pig not being safe at home. Have all your pigs medical information stored somewhere that is easily accessed. Plan now so you aren't left panicked. Your pig can't do anything to help his or herself, it's up to you to plan for their safety and well-being. How can you keep your pig safe during a fire? Know what is going on in your area. If there are fire warnings, take that threat seriously. Do NOT let your pig roam in large pastures if your pig is one that doesnt come when called or gets scared easily. Prepare your family and your pig(s)/other pets for the worst possible outcome. Think ahead and plan on something bad happening. At the very least, you stay ahead of the game when thinking that way. Crate train your pig. Obviously a pig in a crate is much easier to manage than a panicked pig on the run. Harness train your pig. Some pigs do well on harnesses, but keep in mind, if theyre struggling to breathe because there is buring embers falling on their heads and so much smoke that you cant see your own hands, this may affect the way your pig behaves and your normally well trained pig may panic. Hot embers falling could actually burn your pig and create chaos. Keep towels easily accessible that you can wet and wrap your pig in should this be the case. Ramp train your pig. There are life threatening situations that require prompt action on your part. Trying to get a pig to go up a ramp when it isnt an emergency is difficult, so you cannot expect an untrained pig to willingly use a ramp, on an incline during an emergency. Your pig doesnt realize it is life or death. You MUST prepare beforehand. Have your family come up with a strategdy whereas each memeber is "assigned" to a pet and it is that persons responsibility to get that pet and whatever supplies are needed in order for your family to get to safety. Do emergency drills with your family so there is less chaos should any of this need to be ultilized. Have a skin friendly marker available in case you do have to leave your pet there. Write your contact information directly on the hooves or sides so there is some kind of identification to contact you, if needed. Remember pigs have great instincts. Pigs that are usually mild mannered and sweet may not act the same when faced with a crisis. Choose one word that will cause your pig to come running back to you for emergencies. The word "treat" works well for me. If I use that word while my pig is sleeping, she hears it and gets up and starts squealing. This is my "safe" word for my pig. She will ALWAYS come running when she hears it and if she doesn't, then I know somehting is wrong. Find out what shelters allow pets in your area. Call ahead and find out which ones allow pigs specifically. If you have an extra crate, keep that in the same area as your vehicle so you can easily grab it if youre not able to get the usual one to your car/truck/SUV in a timely manner. Centralize all your supplies so that theyre easy to find in an emergency including food and water. If you can evacuate beforehand, GO! Don't wait if you have a safe place to go away from danger. ​This is something we quickly created using standard pictures from Google. Emergency workers have no idea what animals you have unless they see something that grabs their attention like the picture above. 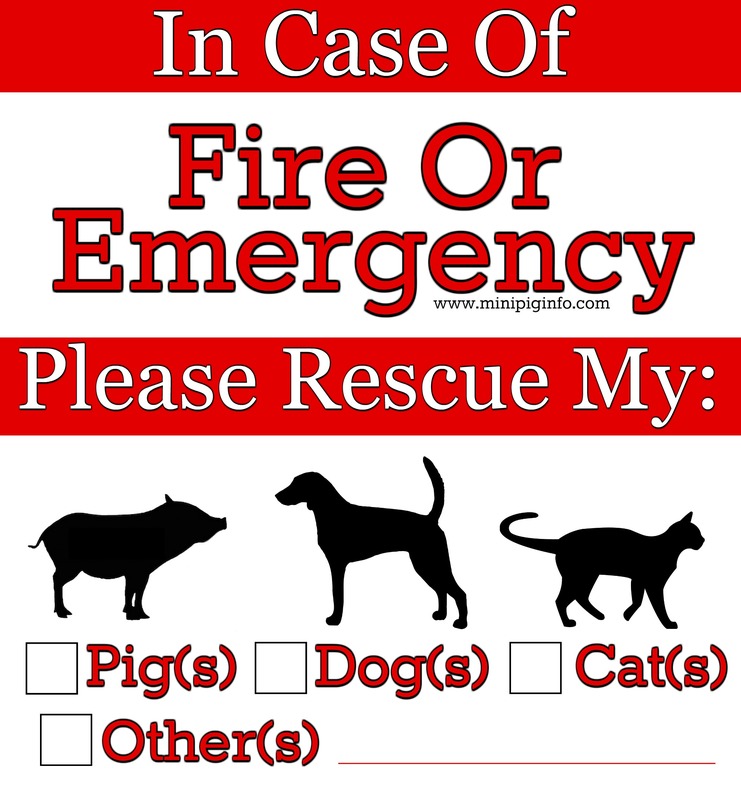 Feel free to download the picture by clicking the file below and printing off and laminating or making it into a sticker so your pets will be saved should the emergency personnel know they're there. When you download the file below, this is a .png and can be edited to suit your individual needs. We may create a nice version at a later time for stickers and have some for sale at some point. For now, this will work. Disaster preparedness is important for all animals, but it is especially important for livestock because of the size of the animals and their shelter and transportation needs. Disasters can happen anywhere and take many different forms—from hurricanes to barn fires, floods to hazardous materials spills—forcing possible evacuation. Whether you evacuate or shelter in place, it's important to be prepared to protect your livestock. Ensure fencing is secure to contain your animals and keep out wildlife that can possibly pose a threat. If there are areas of weakness in your fencing, your pig will surely find it. Give your pig a fighting chance should you not be able to evacuate your pets. Make sure they have the basic things they need in order to survive. •Not less than one acre in size (if less than an acre, your livestock may not be able to avoid blowing debris). If you have an animal emergency, contact your veterinarian or emergency veterinary clinic immediately. Click here to see a list of vets that treat pigs. Click here for information about first aid for your pig specifically, including a recommended supply list. Click here for CPR/Heimlich instructions for pet pigs. If addition to these seven things, you should also be prepared with methods of payment for your pet's emergency care. Emergency care is often more expensive than routine care due to the intensity of diagnostics, monitoring and treatment required, and it is your responsibility as a pet owner to pay for that care. Many clinics are unable to bill you for the services, or may require a deposit or payment in full at the time of service. Delaying emergency care to avoid emergency fees could put your pet's life at risk. Planning ahead for financial coverage of emergencies - perhaps by having a separate account or credit card for emergency use only, or pet insurance - can save you a lot of stress when they do happen. Care credit is a credit account most vets accept as a form of payment. You should have this set up BEFORE your pig needs emergency care. How to muzzle your pet (to keep an injured pet from biting you) A crate can safely house your injured pig while also protecting you from being bit. There are times when a storm is expected and although not mandatory, it is suggested that you evacuate your home. What do you do? If you have a bigger and older pig, this isn't as easy as it was when your pig was 30 pounds, however, because your pig is much bigger, it is probably more important that you take action earlier versus later. We can't possibly know when there will be a flood or a tornado, however, if we live in areas below sea level with a history of flooding, you can be prepared. I can't imagine having to choose between my pig and my kids, but I also can't imagine leaving my pig behind alone. It is also very easy to judge someone else's decision when you have never been in that position where you had to, but I am quite certain a decision like that had to be made immediately and was also very difficult. Even if you are prepared, there are situations that arise that you can never have predicted would happen, but for the ones that you worry about because they have happened before? Prepare yourself now!! 2. Pet life jacket. If worst comes to worst, your pig can have a chance by giving them the tools to survive. For flooding specifically, especially in flood prone areas, having this accessible can be the difference between life and death of your pig. You will likely have to find a vendor or person to make a custom life jacket for your pig because most of these life jackets that are made for pets are geared towards dogs and these will not fit a pig appropriately. Here is an example of one though for your reference. As soon as I am able to find a company that makes customizes them, I will update this post with that company. 3. If your area is prone to tornados, you may or may not have a storm shelter. (We do not have many tornados on the east coast, so my experience with this is extremely limited) If you do have a storm shelter and your pig is not harness trained, now is as good of a time as ever to get that done so if you need to get to safety, your pig is willing to go with you on a harness and leash. Click here to see people who make pig specific harnesses and click here to read our page that discusses harness training. 4. If there are other reasons why you may need to evacuate, crate train your pig so it isn't a big production to get your pig in a crate. This can easily be done by feeding your pig in the crate every once in a while. Do NOT use the crate as a form of punishment because your pig will associate the crate with being in trouble and in order to evacuate, time is NOT usually on your side. 5. 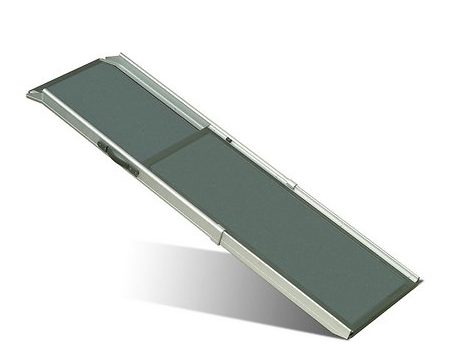 If your pig is bigger and you aren't able to physically lift them, have a ramp or mounting stairs available to make life much easier in getting your pig loaded in a car/truck/SUV. This is one that comes highly recommended by other pig parents. Sometimes there is just an emergency and there's no way you can be prepared, but please have things available to you in areas that are prone to natural disasters like floods, wildfires or hurricanes. Our pigs are counting on us to keep them safe and it never hurts to be over prepared. ​Having some of these things in place is the difference between having a pig and loving a pig.